1. 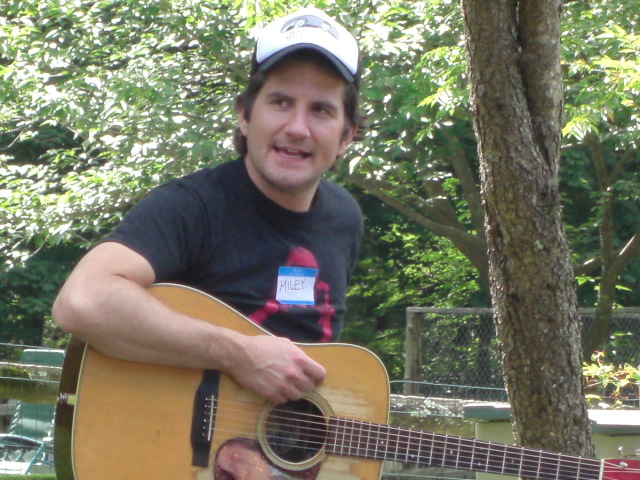 Iowa City, IA – Matt Nathanson – 3h, 55m: Kelly and I didn’t originally have tickets to this show. It was on a Sunday and we’d already seen a couple of other stops on that tour, so by the time we decided we wanted to go, it was already sold out. I don’t remember how I got in contact with a guy who was selling a pair of tickets… Craigslist maybe? But he replied at like 5am that Sunday morning saying he was putting them on eBay and whoever got to them first got to them first. I happened to wake up and check my email moments after he’d sent it, so I shot out of bed, sprinted into the living room, and bought the tickets. Since it was a Sunday, I wasn’t scheduled off for work the next day, so I left my supervisor a voice mail that morning and was like, “So, I need off tomorrow… I put in a vacation request and I hope it’s okay because if it’s not, I’ll already be in Iowa…” Thankfully my boss is awesome and he was fine with it. It turned out to be one of my favorite MN shows to date. I wrote up a little spiel you can check out here if you’re interested. 2. Minneapolis, MN – Matt Nathanson/Counting Crows – 5h, 3m: The Basilica Block Party is a big music festival that happens every summer. In July of ’09, Matt Nathanson was slated before Counting Crows one night so, of course, we went. I was in a surgical boot at the time because of a broken foot (see trip #7 for more details). I contacted the venue to ask about handicapped parking and they offered me VIP passes, since the only seats are in the VIP section. This sounded awesome until we got there and the “VIP” section was like 30 rows back from the stage. I preferred to stand (terrible idea) so by the time Matt was done, I was in such pain that I was almost crying… and by the time the Crows were done, I WAS crying. But this is what you go through for your bands! Blood, sweat, and tears! After the show we got totally lost and walked for what felt like FOREVER. I was a bit melodramatic because I was in so much pain and hobbling around in my boot made my hips ache in addition to my foot, so when we turned a corner and there was my truck, I YELLED, “SAMMY!”, causing several people around us to jump. Oh! This was also the trip where we stayed in the sweetest hotel ever – the lobby was on the 2nd floor, and the curtains were zebra print. 3. St Louis, MO – Howie Day, Maroon 5/Counting Crows – about 6 hours: Kelly and I have seen a few shows here… Howie Day at Blueberry Hill in the Duck Room, which is a really neat, small, vibey place. Nick Zuber was the opener on that tour and I think Kelly and I caught 3 or 4 tour stops. We also drove there for the Maroon 5/Counting Crows co-headlining tour at the Verizon Wireless Amphitheater. The crowd was REALLY lame but Kelly and I still made the best of it, and the 11-minute ‘Anna Begins’ will be in my memory forever. I LOVE St. Louis, and every time we go we stop at the Crossroads Diner, this tiny little join with the best burger I’ve ever had. 5. Lawrence, KS – Matt Nathanson – 8h, 46m: We drove this in 2 sections rather than straight through. This was really recent so I won’t bore everyone with the details but here are the highlights: we rented a minivan that had 3 miles on it when we picked it up, we heard ‘Carry On Wayward Son’ as we passed the first sign for Lawrence (Supernatural), Matt played my absolute favorite song even though it wasn’t on the set list, we had to walk from the venue to the hotel and it was fuh-fuh-fuh-freezing, and the morning we left the hotel staff opened some locked rooms for us (Kelly) to take pictures, as the hotel is haunted. 6. Connecticit (I don’t recall the city) – Matt Nathanson: I don’t have the hours on this one because Kelly and I didn’t drive. This is the only “road trip” where we’ve ever flown. We flew into Boston and rented a car to drive to CT for a Matt Nathanson Reps Only event. We visited Salem and the witch trial memorials and ate at a restaurant called The Witch’s Brew. I hit a scooter in Salem with the rental car. We drove into Boston and toured Fenway Park and had lunch at Boston Beer Works, where my entree was called The Green Monster (pesto chicken sandwich). In the middle of all of that, we attended a Matt Nathanson Street Reps Only event at a cafe in CT (horribly awkward, the only person we spoke to all night was one of the musicians playing at the cafe, who taught me the phrase Van Hagar), and the next day was the Reps Only event in the sprawling backyard of a mansion in CT. Matt was delayed by travel so he was an hour late, but once he got there he was personable and funny and played a few old school songs, acoustic, on a picnic table. It was a really unique, cool experience, and it was fun to be surrounded by people with whom you already had a MAJOR hobby in common. 7. Virginia Beach, VA – Matt Nathanson/David Cook – 20+ hours: When I heard that Matt Nathanson was opening for David Cook in Virginia Beach, I couldn’t NOT make that trip. Jean was a trooper and agreed to make the 20+ hour drive, which we did straight through. We left around 8:30-9am and arrived at the concert site (aka the ocean) to get in line for tickets at 5am. This is where I met Andrea and Brianna for the first time after talking to Andrea online for years and years. Once we had our passes, we walked down to the ocean and Kelly and Jean even talked me in to wading in up to my knees. We sat in the sand and watched the sun rise, and being there with my gals was one of the greatest moments of my life. The concert was actually IN THE SANE next I’ll never forget it. The trip got even better when I met Rhonda and Eireann, 2 ladies I’d met online YEARS earlier but had never met in person. When we were heading out, we bought a 20 lb bag of ice from a gas station and I accidentally dropped it on my foot. My foot swelled up to the size of a softball, and gave me pain/swelling for A YEAR (see point #2). The drive home we split from VA to IN and slept in the skeeziest hotel I’ve ever been in in my entire LIFE (pubic hair on the bathroom counter, for example), and then IN, home. Oof, this made me so nostalgic. I crave another road trip right now!